Robert H. Lustig, M.D., MSL, is professor of pediatrics in the Division of Endocrinology and a member of the Institute for Health Policy Studies at University of California, San Francisco. He has authored 120 peer-reviewed articles and 70 reviews. He has mentored 30 pediatric endocrine fellows and trained numerous other allied health professionals. He is the former chairman of the Obesity Task Force of the Pediatric Endocrine Society, a member of the Obesity Task Force of the Endocrine Society, and a member of the Pediatric Obesity Devices Committee of the U.S. Food and Drug Administration. He is also the president of the nonprofit Institute for Responsible Nutrition, dedicated to reversing childhood obesity and Type 2 Diabetes. He consults for several childhood obesity advocacy groups and government agencies. "Our health, resistance to disease, and ability to function on a day-to-day basis have essentially been hijacked, all in the name of corporate profits. Dr. Lustig explores how industry has manipulated our most deep-seated survival instincts to motivate our food choices in a way that directly undermines our ability to survive. 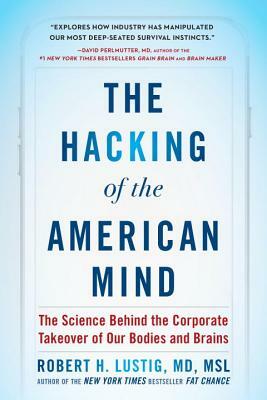 But more importantly, The Hacking of the American Mind eloquently reveals how we can disengage from this influence and re-establish ourselves on a path to wellness." "Robert Lustig takes on one of the greatest paradoxes of our time: how can it be that we have more sources of pleasure than ever before in human history, and yet are increasingly sick, broke, and unhappy? By deftly weaving together neuroscience, history, economics, and more, he provides a much-needed explanation of how the 'pernicious peddling of pleasure' causes real happiness to elude so many of us — and also provides a desperately needed roadmap for escaping the pleasure trap." "Pleasure and happiness are not the same thing – as our addictions to everything from unhealthy food to cellphones show. In this book, Dr. Lustig unpacks the science of pleasure versus happiness to explain the true causes of the last 40 years of addiction, depression, and disease. The good news is that the solution is easy — well, maybe not so easy — put down your cellphone. And sleep. You’ll be happier, and you’ll live longer!" "Dr. Robert Lustig examines our culture of illness, an industry-created fog that, despite our best efforts to cope, has left us stressed, isolated, addicted, and depressed. With The Hacking of the American Mind, he empowers us with the science of mind, brain, and love in a delightful, insightful, and humorous way. You can live by pursuing pleasure, sugar-coated as 'happiness,' or you can read this book."